Spectators cheered and sang on Thursday as the annual Macy's Thanksgiving Day Parade made its way through the crowded streets of Manhattan beneath brilliant sunshine. 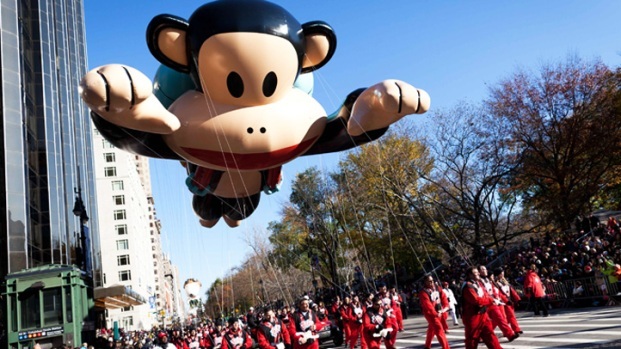 A jetpack-wearing monkey and a freakish creation from filmmaker Tim Burton were two of the big new balloons that made their inaugural appearances. Paul Frank's Julius and Burton's B. joined more than a dozen other giant balloons, including fan favorites like Snoopy and Spider-Man. "Here comes Snoopy!" said an excited Regan Lynch, 5, nudging her grandfather, Nick Pagnozzi. In all, the parade featured more than 40 balloon creations, 27 floats, 800 clowns and 1,600 cheerleaders. Star appearances included Mary J. Blige, Cee Lo Green, Avril Lavigne and the Muppets of Sesame Street. Some performances were at a stage at the end of the route in Herald Square; others were on floats. "I feel like a kid all over, man, you know?" said Green, who rode a float featuring young hockey players. In the crowd along Seventh Avenue, tourist Wilfred Denk of Munich, Germany, said he was most impressed by the high school marching bands. The procession featured bands from as far away as Hawaii. "Those kids, they play good music and they really put on a good show," Denk said. He and his wife, Bethina, were on their honeymoon in New York. Suddenly, a float bearing a replica of Mount Rushmore came into view. "Look, Neil Diamond!" said Bethina Denk. The crowd started singing "Sweet Caroline! Whoa! Whoa! Whoa!" as Diamond waved from a platform in front of the Mount Rushmore heads. "I like the bands best," he said. His brother preferred the Spider-Man balloon. Dozens of handlers got revved up with a cheer heralding their cartoon balloon character: "Buzz! Lightyear! Buzz! Lightyear!" Nearby, balloon handler Joe Sullivan, a retired banker, held one of six nylon lines securing a huge floating pumpkin. 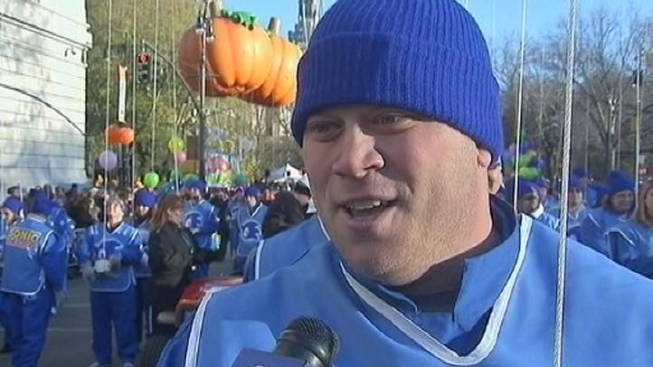 He's been volunteering in the parade for more than 15 years. "When it's windy it's a struggle," he said. "But today is great weather." Macy's predicted 3.5 million people could crowd the parade route, while an additional 50 million watched from home. The parade begins at 77th Street and heads south on Central Park West to Seventh Avenue, before moving to Sixth Avenue and ending at Macy's Herald Square. Sherre Chaplen, 49, of Thomaston, Conn., said she was surprised by the energy of the clowns and musicians, who are often overshadowed by the balloons on television. Chaplen came to New York with her teenage daughter and husband. "This was on the bucket list," she said. "It's so much different seeing it live than at home. It's something everyone should do at least once in a lifetime." The parade got its start in 1924 and included live animals such as camels, goats and elephants. It was not until 1927 that the live animals were replaced by giant helium balloons. The parade was suspended from 1942 to 1944 because rubber and helium were needed for World War II. Since the beginning, the balloons have been based on popular cultural characters and holiday themes. Returning favorites this year included Buzz Lightyear, Clumsy Smurf, SpongeBob SquarePants and Kermit the Frog. The 2011 parade also featured an elf balloon designed by Queens resident Keith Lapinig, who won a nationwide contest. All the balloons are created at Macy's Parade Studio in New Jersey, and each undergoes testing for flight patterns, aerodynamics, buoyancy and lift. The floats are driven into New York through the Lincoln Tunnel before the parade.